We are certainly enjoying the lovely spring with all the flowers: tulips, daffodils, pansies and the roses about to bloom. The dogwood and flowering fruit trees were lovely and have now turned into beautiful green leaves. Certainly they are a creation of God’s handiwork and variety. Genesis 1:12 says, “And the earth brought forth grass, and herb yielding seed after his kind, and the tree yielding fruit, whose seed was in itself, after his kind: and God saw that it was good.” And until today it is good and beautiful! If variety is the spice of life, as they say, then our lives are truly spicy. Some ask what we do now that we are in the States more than on a foreign field. Perhaps we can give you a little idea with what we are involved. For example the Putney Memorial Church was near to closing its doors when we came home. Gary, along with three other men had been preaching and holding the church together. But now there are only two men helping Gary, so please pray with us for those men and the small congregation. They are in a needy neighborhood and plans are being made for a July VBS. Pray that many children will attend and lives and homes can be changed for God’s glory. 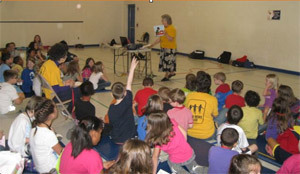 During the school year we help in the Good News Club at a public school. This year we have been involved with the 5th grade class, and Pat has taught (pictured above) the missionary lesson to all the children. What a wonderful opportunity to share Christ with these children and their parents. It is amazing to hear the stories of the children and their prayer requests. There have been 118 children in the club and 62 of them have prayed to ask Jesus into their hearts. Pray for these children that they might remember the lessons they have been taught in the club, and apply them to their lives. Variety? Yes, children’s work, church ministry, and then we are also involved with two senior groups in another church. The “Jolly Seniors” meet once a month for a meal which we help cook and serve. There is a message and special music given by the Christian School children. The senior citizens from nearly 20 churches attend, giving an average of 175 people; meals are carried to the shut-ins. The “His-timers” do various activities of fun and ministry, like visiting an antique car museum, lunch in a State Park, or a concert at a Christian college. Then there is ministry for the Union Mission, where we help in hanging clothes or stuffing envelopes. These activities are times of fellowship and encouragement for the young and not so young. Gary also does visitation to home-bound people, or in assisted living. We recently visited Cleveland Clinic to see a man (Doug) from the church that had a heart transplant and has had some complications. Doug is doing better, now some 13 weeks later, but is still in the hospital and facing more surgery. Pray for him and his wife, Jeanie, who has been by his side every day. Will You Join Us This Summer? We are making plans to head a S.O.M.E. team to Arica, Chile in July for two weeks to help the Bjurs and Jaras. Plans are to assist in the church and also help in one week of youth camp. Please pray that some dedicated young people will want to go, and that their finances will be met. Also pray that the Lord will provide finances for our trip too. We are also planning to return to Kenya in August. Are you interested in joining us for a “working holiday in Kenya”? We hope to visit and encourage the local churches and pastors, teach in the Bethel Bible School, and do some maintenance projects on the station. Variety in ministry is everywhere! The Lord is so good to open many doors for us to give out the Gospel and to help and encourage others. He is also wonderful to give us daily health and strength to serve Him. We are so thankful for YOU and your prayers and support that we might continue to serve the Lord, in Africa and here as well. please send me information about summer mission partnerships/opportunities. We would like to send our young adults for mission trips inside the US.